Bondarzewia berkeleyi: Its nick-name, Stump Blossom, suits it. A gigantic edible. Grows tough with age. Location: Otter Creek Wilderness, MNF, WV. 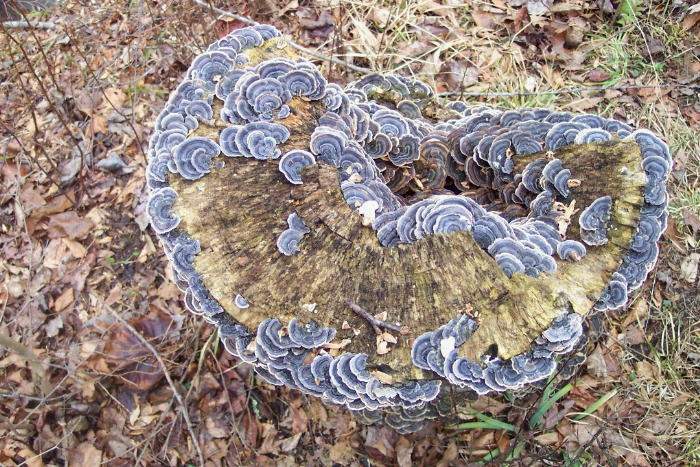 Trametes versicolor: Turkey Tail. This stump and an adjacent log was covered with this fungus. The photo was taken in the winter hence the faded colors. Location: Gunpowder South Trail, GSP, MD. 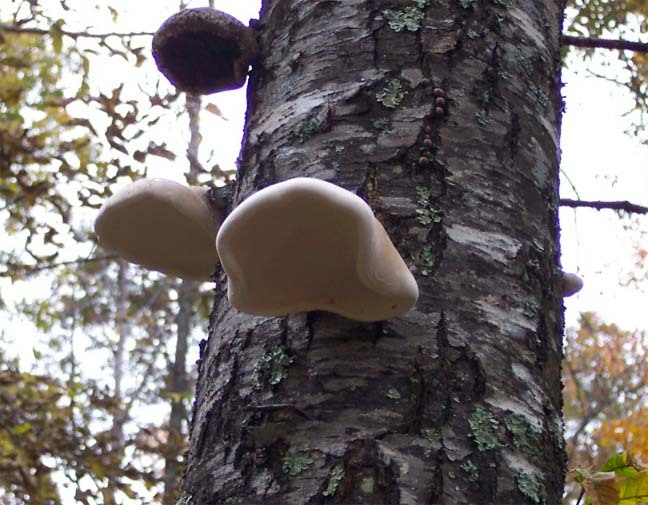 Piptoporous betulinus, Birch Polypore: betulinus is latin for Birch, the only tree this fungus grows on. 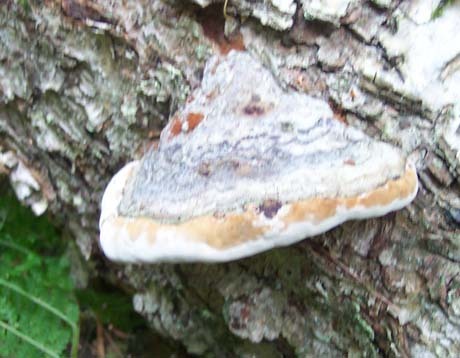 Also called Barber Strop Polypore. Top is white turning brown with age. Note the upturned lip. White Cheese Polypore (Tyromyces chioneus): Moist and soft while young. Pores round to angular. Not edible. Location: Middle Patuxent River, MD. Photo by Ken Clark. Schizophyllum commune - Common Split Gill. Very small, between 3/8 and 15/8".Common. White hairy cap with white to pinkish gill-like folds. Location: Middle Patuxent Environmental Area. Photo by Ken Clark. Laetiporus sulphureus: Sulfur Shelf or Chicken of the Woods. Gets tough with age but considered good eating until then. Location: Hemlock Gorge, MD. Photo by Ken Clark. Fomitopsis pinicola, Red-belted Polypore: Hard with equally hard white to pale yellow pore surface. 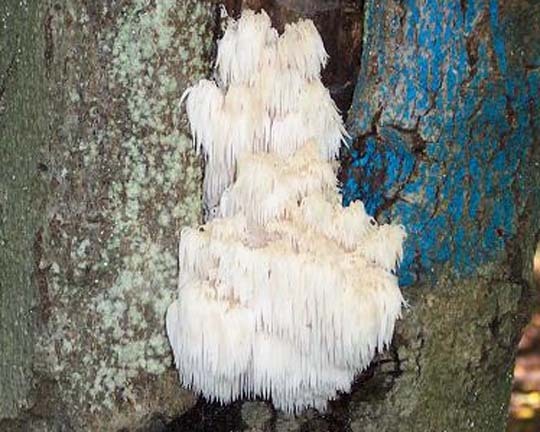 Location: BFT, PA.
Hericium americanum: Lion's Mane / Bear's Head Tooth. 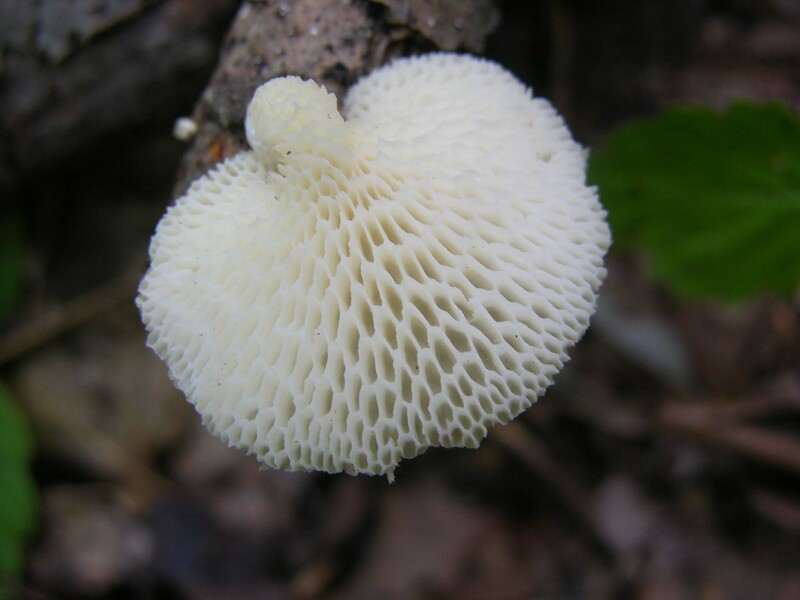 A branched tooth fungus. Teeth very long. Choice eating. Location: Mylius Trail, Otter Creek Wilderness, MNF, WV. A baby mushroom found during a hike, and the same specimen 6 days later. Dryad�s Saddle or Pheasant's Back Mushroom (Polyporus squamosus) typically grows on the side of a tree trunk, so it is unusual to find this round/centric form. Photo by Ken Clark. Location: Patapsco State Park, Daniels Area, MD. 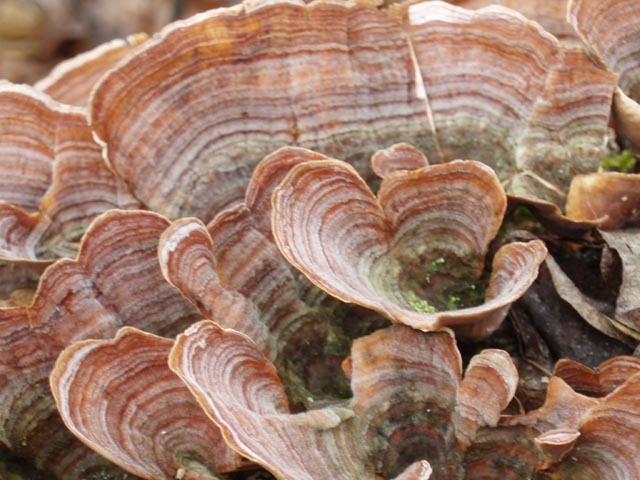 Stereum ostrea: False Turkey Tail. 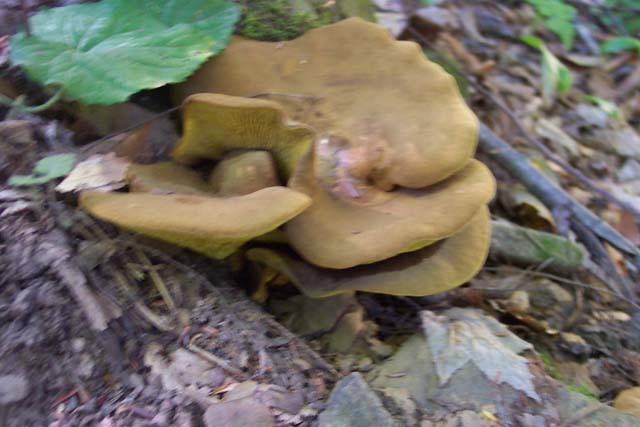 Location: Sherman's Gap Trail, Massanutten Mt, GWNF, VA.
Ganoderma lucidum (Ling Chih or "Mushroom of Immortality" in China): Similar to G. tsugae but grows only on broad leaf trees and stumps. The stalked specimens, as shown here, are valued in the orient for medicinal uses. 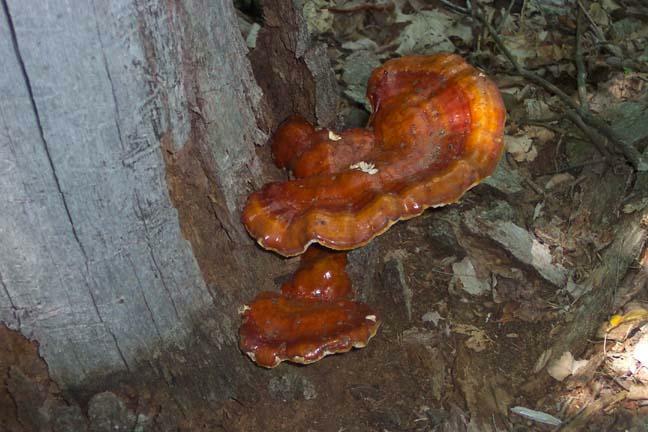 Ganoderma applanatum: Artist's Palette or Artist's Fungus. Looks like a palette but artists have used its surface to paint on. Location: Red Creek Trail just down river from "The Forks ", Dolly Sods, MNF, WV. 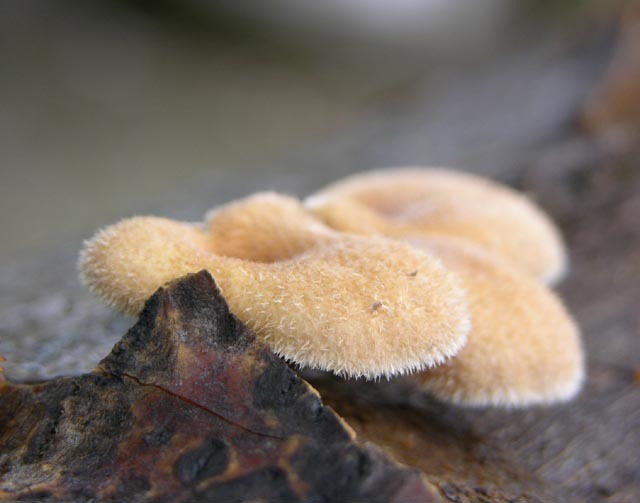 Panus Rudis - Rudy Panus: Grows on wood. Quite hairy. Fan or Kidney Shaped. Gills descending to stalk. Found from spring through fall. Location Flag Ponds, MD. Photo by Ken Clark. 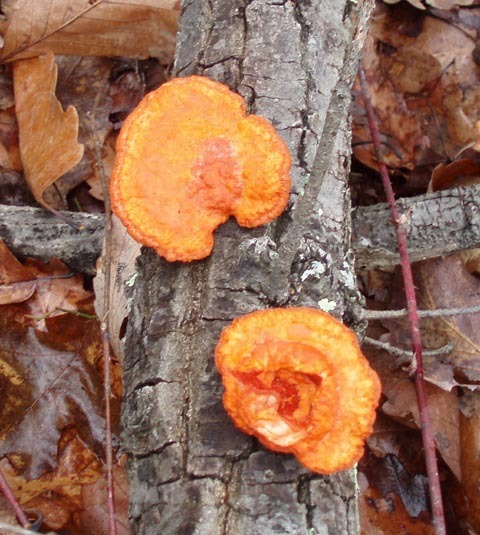 Pycnoporus cinnabarinus - Cinnabar-red Polypore: Bright red/orange. An annual found on dead deciduous trees. Not edible. Location: Sherman Gap Tr, Massanutten Mt, VA.
Fomes fomentarius: Tinder Polypore. Native Americans dried it and used it to start fires, hence the name. Location: Otter Creek Wilderness, MNF, WV. Hericium erinaceus: Hedgehog Tooth Fungus. No branching w/short teeth. Good eating. In their prime they are snow white. These are a bit old. Location: Great Falls NP, VA. Photo by Ken Clark. 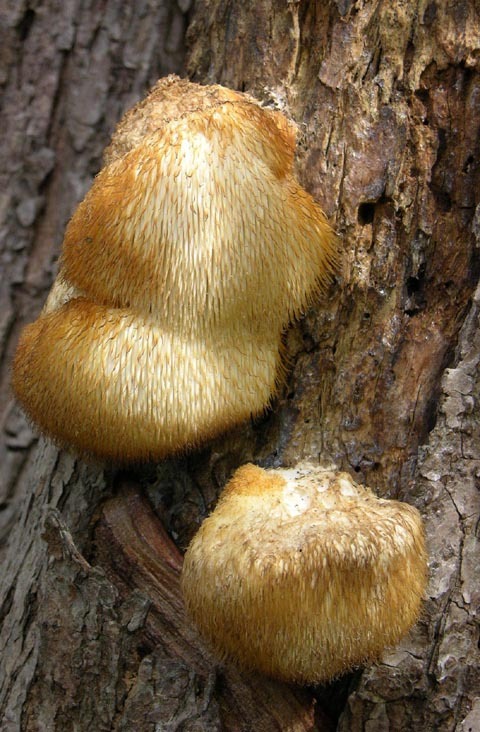 Favolus (Polypore) alveolaris, Hexagonal-pored Polypore: Older individuals have whiter caps. 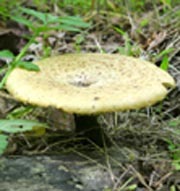 Younger are reddish-yellow to light red. May-November. Edible. Location: Jug Bay, Patuxent River, MD. Photo by Ken Clark. 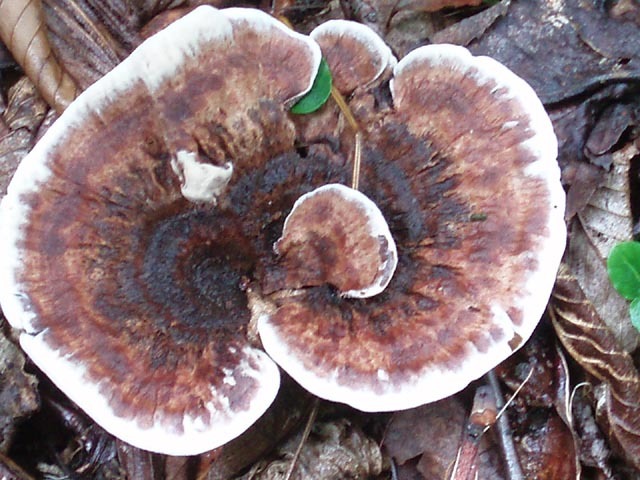 Coltricia Cinnamomeus - Shiny Cinnamon Polypore: Up to two inches in diameter. 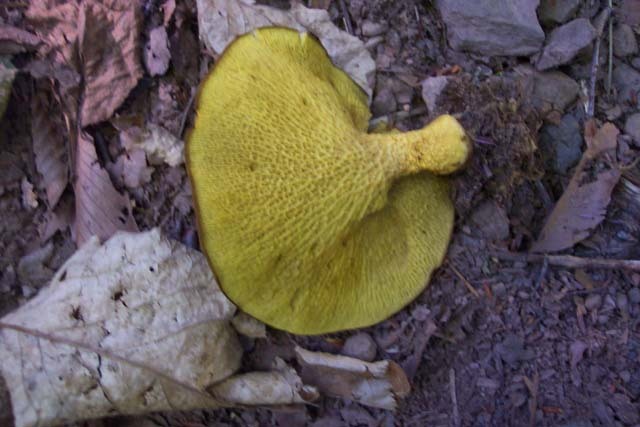 Younger specimens have much darker centers. Location: Possession Camp Tr, Otter Creek Wilderness, WV. Ganoderma tsugae (Hemlock Varnish Shelf): Growing on a log in Kelly's Run/Holtwood Recreation Area, PA. Only found on Hemlock trees or their logs/stumps. Older specimens become more semicircular with dull red finish. 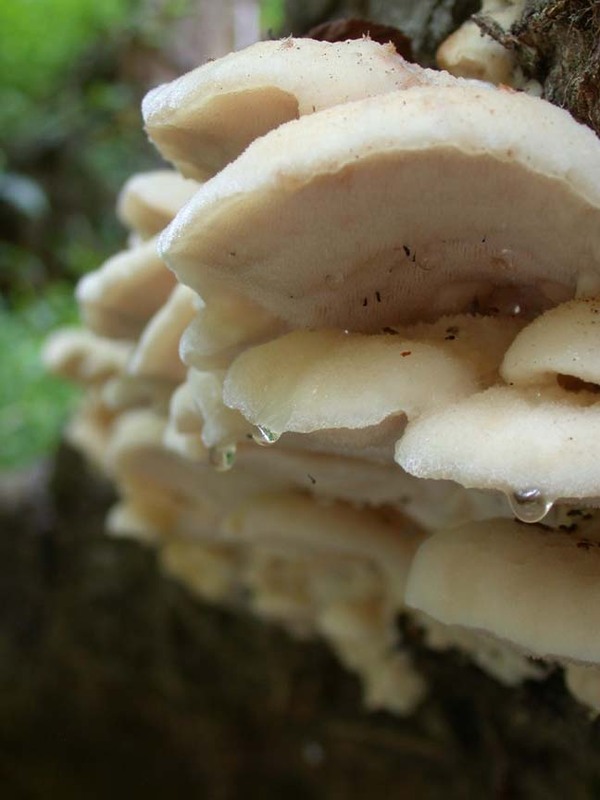 Grifola frondosa: Hen of the Woods. 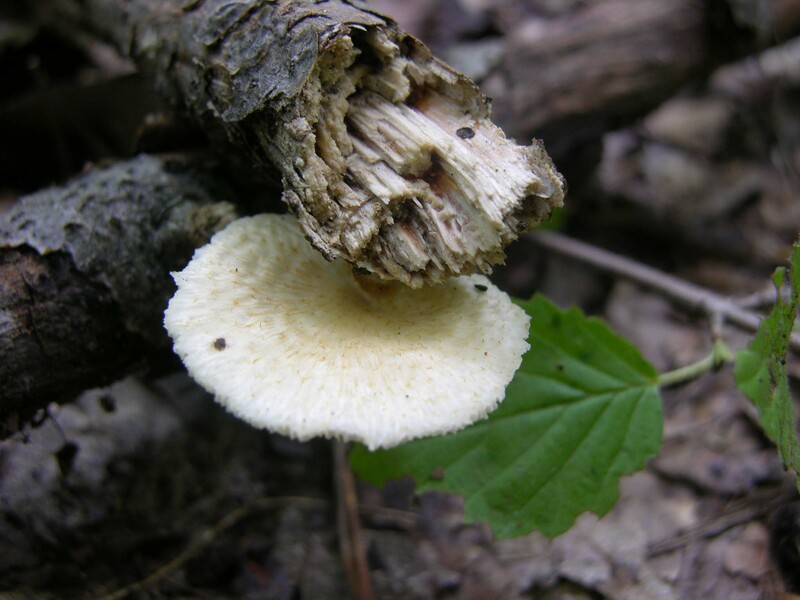 Edibility rated "Choice" but this one, releasing its white spores, is way beyond its prime. 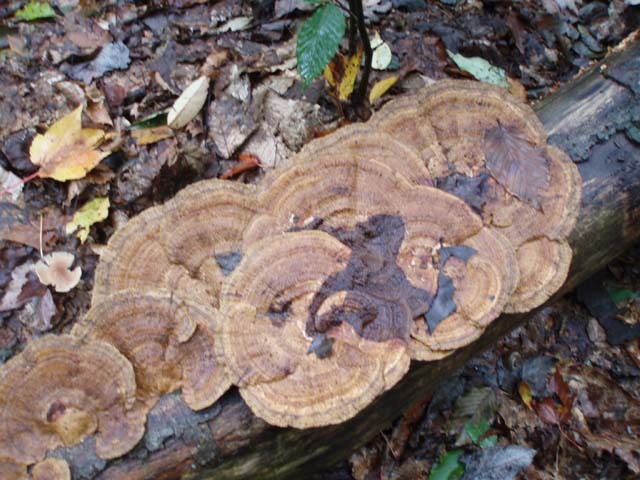 Location: Tuscarora/Massanutten Mt Trail, GWNF, VA.
Hapalopilus nidulans, Tender Nesting Polypore: Ochre in color w/yellow to brown, soft pore surface. June-November. 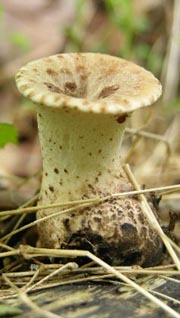 Location: BFT, PA.
Daedaleopsis Confragosa - Thin-maze Flat Polypore - Tough, grayish to brown, zoned or furrowed, stalkless cap. Found in colonies on dead wood. Location: Gateway Nature Tr, Spruce Knob Mt, WV.